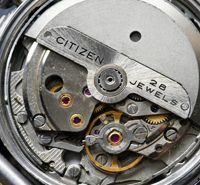 ← Want to know when your vintage Citizen watch was made? 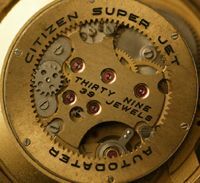 There’s a great thread on the WUS Forum started there by ’31Jewels’, who is a master watch repairer. He is currently working on a couple of Challenge Timers (‘bullheads’) and is showing what he’s been doing to restore them, one is his own, the other a customer’s. 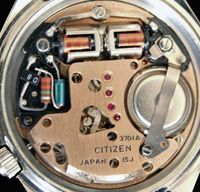 This entry was posted in Vintage Watches and tagged Citizen Bullhead, Citizen Challenge Timer, Citizen Vintage Chronographs, Vintage Citizen Chronograph 8110A. Bookmark the permalink. Please let me know it would mean allot to me! Hi Tiaan, thank for visiting my blog. Can you tell me what is on the dial of your late father’s watch and is it a quartz model or a mechanical one? If you could link to photos that would be very helpful (although you can’t post a picture directly here). ‘4-R00537’ is the case number, but I can’t find any reference to that to help us I’m afraid. The serial number (41200803) will help to date the watch – all I can say at the moment is that it was made after the early 1970s since it is marked ‘water resist’. ‘GN-4W’ is the case type code, and this one indicates that it is a screw on type. I have a 679020 bull head which has been polished and “custoised” with a nex aftermarket orange dial and orange hands. Ok not full original but instead of to try to look like , I prefered to give it a seconf life si I changed the strap for a orange leather strap and then the Watch was looking “fashion”. (Ok don’t struggle me yet!). Anyway a second life begun for this Watch from october 1977…..
Unfortunatly, 1 hour after have been getting the new strap, I made the Watch fall..and the Crystal was broken. do you know where I can find a new glass? Thanks a lot§. your quickness to answer is as great as your knowledge about the 8110 bullhead or not! I didn’t understand yet how to load you a picture so you could see the disaster! 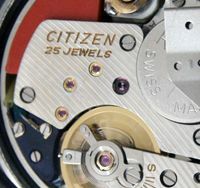 The 6501 is a good quality movement, which had only a short production run as Citizen focused on quartz and reduced the range of mechanical movements to a minimum. Hi Siddarth – thanks for visiting my blog. 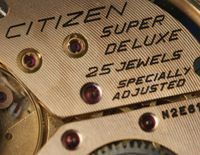 I’m less familiar with the later quartz models than with Citizen’s vintage mechanical watches. There have been so many quartz watches made that it is difficult to find information about them and when they were made. I have had a couple of other people ask about watches with the 6031 movement and after a bit of research I would think it was produced in the late 1980s/early 1990s. The serial number of yours gives us a likely production date of July 1991. The model number is 6031-T62150, and the ‘>6’ marking indicates where the back should be levered off (i.e. the 6 o’clock position). ‘YP’ is ‘yellow plate’, so the watch is gold tone, over a base metal case. I resist trying to do valuations, but I would think this model will not have any great value.